The Clamp-On Meter Model F1N is designed to take measurements on low and medium power electrical installations in conductors carrying a peak current of no more than 1000A. The True RMS current measurement range extends from 300mA to 400A. 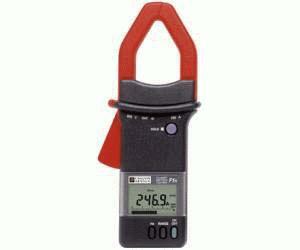 The meter measures true TRMS current, frequency (Hz) and holds the last measurement on the digital display while the bargraph continues to display the instantaneous. The Model F1N has automatic or manual selection of the display range, a 40-segment analog bargraph, battery test on the bargraph during operation of the instrument, battery level indicator and auto power off after 10 minutes of non-use.